Last week’s FBI indictments revealed a ‘gaping loophole’ in the admissions process at many brand-name colleges and universities. How was it overlooked for so long? 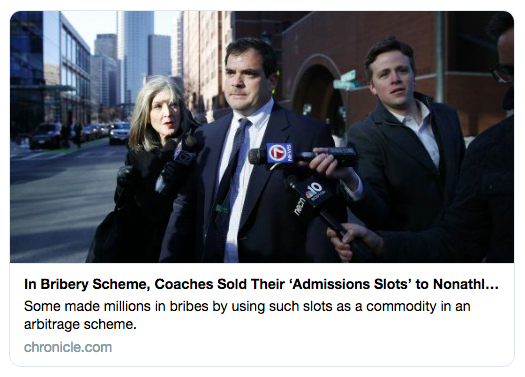 Last week’s federal indictment laying out fraudulent practices designed to sneak kids into elite colleges and universities generated a massive media response. Some of the elements were sadly familiar: wealthy parents looking for every advantage, abuse of accommodations for kids with disabilities, outright cheating on college entrance exams, a closed-off admissions process. 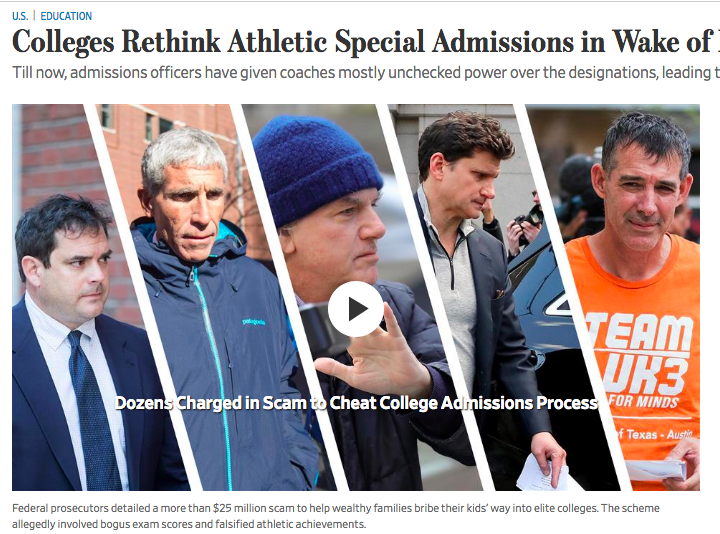 But there was one aspect of the scheme that generated expressions of surprise: News that someone was systematically bribing unscrupulous coaches and other athletic department officials at elite institutions to slip the children of wealthy parents in through a largely unsupervised admissions process. “Something like this never would have crossed my mind,” the University of Portland’s Karen Peters told The Chronicle’s Andy Thomason. “I think everybody was blindsided by this,” USC’s Lynn Swann told the LA Times. Everyone, including the journalists who cover college admissions, seemed surprised that this specific route into elite institutions turned out to be so big and so easily exploited. That seems strange. The desperation of some families to get their kids into elite schools is well documented. The admissions process has been exposed as murky and unethical. Bribery and corruption are as old as time. And the process of transmitting athletic department recommendations to the admissions office turns out to have been essentially run on the honor system. This wasn’t a side door. This was a barn door. And it was open wide. At many schools, coaches were allocated a certain number of spots and gave admissions a list. That was pretty much it. Of course, it’s much easier to see things clearly after the fact. But the question remains: how did everyone seem to get caught so flat-footed? If they knew that the system was open to this kind of abuse, why didn’t they report their concerns and dig for concrete instances? If they didn’t know, why not? This isn’t the first time in recent memory when holes in media coverage of an important education story have been revealed. It probably won’t be the last. But perhaps, by reflecting on what happened, we can improve our future work. To learn more about how the media covers education, follow The Grade on Twitter and Facebook. In the week since the FBI indictments were revealed, journalists scrambled to report how powerful coaches’ influence over admissions had become — and how little supervision was being provided. Last Tuesday, the FBI announced indictments against 44 individuals, among them Hollywood actors, wealthy individuals, and a Houston-area educator. Mastermind-turned-cooperating-witness Rick Singer raked in an estimated $25 million to get rich parents’ kids into places like Yale, Stanford, and USC. The average payment was about $400,000. It was the largest-ever college admissions prosecution by the US Department of Justice. Many of the allegations were familiar ones. Elite college admissions have always been “pay to play,” wrote the Education Writers Association’s public editor Emily Richmond. The FBI announcement represented “the logical, if extreme, outgrowth of practices that have long been prevalent under the surface of college admissions,” according to ProPublica’s Daniel Golden, who wrote a book about college admissions in 2006. The only substantially new practice revealed in the indictment was bribing coaches to get nonathletes on the list. According to the indictment, coaches were involved at Georgetown, Wake Forest, the University of Southern California, Stanford University, and Yale University. But we don’t yet know how many times this particular strategy was employed. Singer says he helped parents gain admission to elite schools 761 times over a number of years, through various illegal means. 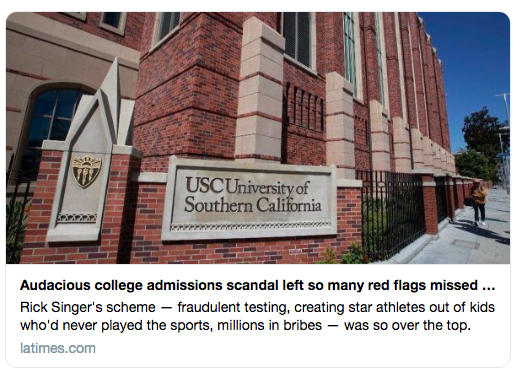 Close calls reported in this LA Times story include suspicious college counselors, easily debunked claims of athletic prowess, and a parent bragging publicly about how he secured a spot for his child. How did the athletics department loophole work? At many selective colleges and universities, athletes are given special consideration in the admissions process, with four times the acceptance rates of similar non-athlete students, according to the Mellon Foundation’s “College and Beyond” report. The total number of spots varies widely but can be substantial. Roughly 158 per year were given to athletic recruits at Georgetown, according to the affidavit. And the squad sizes — 30 to 40 players on a soccer or lacrosse team, 100 or more rowing crew — create enormous opportunities, as do the number of different elite, non-revenue sports such as water polo, tennis, and sailing. However, the athletes recommended by coaches and athletic department officials were not apparently vetted or reviewed by the admissions office in most of these cases. And coaches in some programs were responsible for raising funds for their own programs, creating mixed incentives for who they might include in their admissions recommendations. This created what the Chronicle’s Thomason described as “a gaping loophole.” Given a hands-off, trust-based system like that, a coach or athletic department official could put kids on the list who didn’t really deserve it, and nobody would notice. Asked if he was surprised to find out about the bribery, Villanova’s Rick Eckstein, an expert in youth sports, said via email that he was “not very surprised.” Bribing coaches was “just a short step” from what was already been happening. Indeed, there were red flags all over the place. Singer and his allies made brazen claims about students’ records “that could have easily been detected with a simple internet search,” according to Friday’s LA Times. Parents bragged about what they’d done. More than once, high school counselors raised concerns about their students being admitted as athletic recruits. The scheme revealed last week relied on cash-strapped athletic department officials and lax oversight in the admissions process, two aspects of the college admissions process that had received little attention. In the past week, university officials have given a number of explanations for why they hadn’t seen and closed off this loophole before now, including the need to rely on the athletic department’s expertise and the complexities of tracking who’s accepted under which kind of preference. They trusted their colleagues. They couldn’t conceive of someone abusing the system this way. Among journalists, only the Chronicle’s Hoover and ProPublica’s Dan Golden have expressed surprise at the athletics department loophole or dismay at not having covered it. A more common response boils down to ‘how could we possibly have been expected to have known this?’ “Sometimes you can’t even imagine something if you’re an honest person,” said the Education Writers Association’s Kim Clark in a recent phone interview. Others, like Inside Higher Ed’s Scott Jaschik, point out that bribery related to college admissions has been reported before, including last year at Penn, in a case in which basketball coach Jerome Allen was paid $47,000. Misdeeds taking place in small numbers inside cloistered institutions are notoriously hard to detect, especially without a tip from inside, say others. “There’s no real way of being able to report on [the athletic department loophole] without having gold-mine sources on both sides,” University of Georgia journalism professor David Welch Suggs wrote via email. But I worry there might be more to it than that. It doesn’t take a gold-plated whistleblower to start writing stories about concerns and questions bubbling up. The Penn bribery story wasn’t picked up as widely or explored at other institutions. Blind spots are real. And this isn’t the first time in recent memory that education coverage has proved to have been inadequate to the task. Going forward, university officials say they are urgent at work finding ways to close off the athletic department loophole and restore credibility to the admissions process. Journalists should use last week’s revelations as an opportunity to make whatever changes — greater coordination with sports and finance reporters, more diversity on the coverage teams — are necessary. I hope that reporters and editors will use this situation as an opportunity to reflect on past practices and consider new ones for the future.